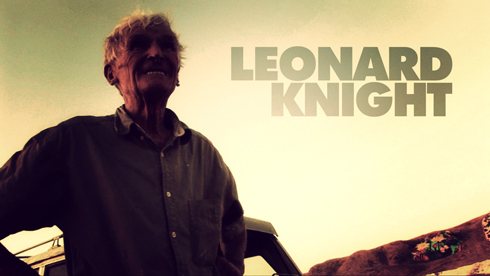 Day Five (08.27.09) I never had any intention to interview Leonard Knight when I first thought about heading out to Salvation Mountain. The conversation we did end up having just struck up after we went to thank him for letting us tour his site. Leonard lives in a little trailer right next to Salvation Mountain, and not surprisingly, the trailer is decked out in paint just like everything else in the vicinity. His lifestyle and focus have clearly defied convention. You'll notice my low angles, and it's because I wasn't that concerned about my footage as much as I was about having a real conversation. Leonard is nearly 80 years old, and who knows how much longer he'll be around to talk about his mountain or give personal tours. More than just a subject for a video, I really do respect Leonard Knight for what he's accomplished in such a unique way. This edit over all the others was interesting to construct because Dave was using my mini-cam to capture footage also. It made it a lot more interesting to cut between dialogue. All around, this experience proved to be a great cap to an already amazing road trip.